We stopped off at this ruined megalithic tomb on our way to Horn Head. The tomb is situated close to the main road and visible from there. I was disappointed with this tomb; it was quite difficult to determine actual classification due to the ruined state and the abundance of brambles. 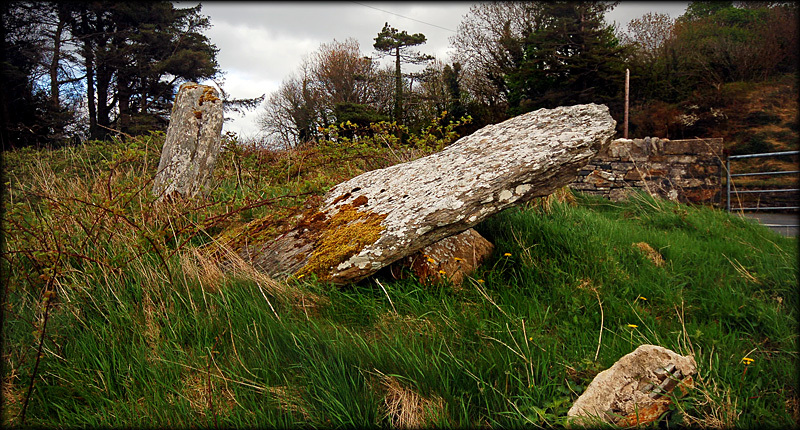 I presume it was a portal tomb and the large stone, pictured above, was the capstone. The orthostat pictured left may have been a portal stone. Lying under the large slab could possibly be a side stone or back stone. There is a superb view south from here towards Muckish mountain. 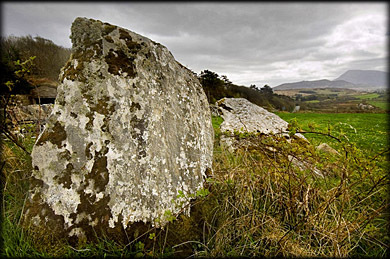 Situated: Quite easy, from Creeslough take the N56 north towards Horn Head. After four kilometres you will see a large church set back from the road on your left, park here The tomb is in a field through the gate on the left hand corner of the main road. Discovery Map 2: C 0497 3474. Last visit April 2010.